Do I have to be a registered user to access the website? Yes, you have to register on the website using a valid email address to access all the contents of the website. A limited access will be available to a non-registered user. Can I buy the books directly from the website? How do I enrol for Classroom Course? To enrol for the Forensic Accounting Classroom Course, firstly you have to register on the website chetandalal.com. After successful registration, you have to login using your username (registered email address) and password. Inside your account, go to Course Page and view details of Classroom Course. There you will find a link for making payments and enrolling in the Course. Choose the dates on which you would like to attend the course and proceed to payments. In case there are no matching dates or matching city, do write to us at support@chetandalal.com and we would try to arrange a course in your city or as per your dates. What do I do if there is no classroom course in my city? In case there are no matching dates or matching city, do write to us at support@chetandalal.com and we would try to arrange a course in your city or as per your dates. For the classroom course enrolment, what will I get as a confirmation of enrolment? What is the Course Philosophy? Give a man a fish and you feed him for a moment; but show him how to fish and you feed him for the Lifetime’. Our belief in this thought-process is the central theme of the Course that facilitate participants in improvising their ‘Thinking Different’ abilities. In the world of forensics, there is no standard craft to detect and investigate fraud and therefore we believe that each one must constantly evolve by reinventing the three ‘a’s - adapt, adept and augment innovative ideas. This is possible only if a person sheds his fallacious filters that he has woven himself into, for which he needs to be drawn into an open environment that enables stretching his imagination. The best way to ‘learn’ is therefore to ride on other’s experiences in a way that not only hones learner’s skills but also retains the ownership of acquisition. We therefore assert that case studies are excellent way to learn and the best experiential learning emanates from accomplishments acquired from outside the mundane routines. With this philosophy, we bring live case studies from diverse domains that enable users to share and learn from introspection and intra-spection. We only share our experiences amassed over the last more than 25+ years. What is the scope and contents of the e-Learning Course? Today frauds and white-collar crimes are corroding the profits, assets and businesses of many organisations. In some cases, the menace has even completely eroded the organisations and reduce them to ashes. Crimes are observed in the best of the orgainsations, even with superlative people, state-of-art computers /systems, with robust preventive mechanisms and well defined operating procedures and system. Therefore, regulators world over are making the statute more stringent and casting responsibilities on management and others who need to safeguard and protect the interest of various stakeholders. These evils cannot be completely eliminated but can only be kept under check and minimised to a greater extent. Experts say that education and training or just awareness of the frauds itself will make many people effective to combat frauds and thus save large amounts of losses. Thus, this course will increase your chances to understand and arrest the frauds at an early stage and help the organisations to increase profitability, reduce losses and/or complying with local laws. Needless to say, that you stand a better chance to elevate yourself in the corporate ladder or increase your chances with new employments or be effective in your work. So whether you are just graduate and looking for that first job or a junior executive looking for quantum jump in corporate hierarchy or an very experience manager who may be responsible for the work of his juniors or C-level key managerial person, all will benefit from the case studies and awareness about the evils in society. Hence this course will immensely benefit not only the auditors but also all other managers who may be in non-accountancy profession too. Is the eLearning Course a live streaming? No, the e-learning course is not live streaming of any classroom course but a recorded event of various modules. The recording is done in a specific manner where the subject matter expert and learning experts have created work that will optimise best learning for various classes of users. Each module deals with a particular subject wherein there are explanations of the subject with relevant parables and real life case studies. Hands-on tutorials with test packs are also part of the relevant modules that will assist the user to practice it along with the course is in background. What will happen if I miss any module? You will not miss any module since all are pre-recorded events and the course can be taken on demand anytime, anywhere and on multiple times (subject to terms and conditions). Therefore, you will not miss the module and the same can be taken and revised as per learning requirements of the users. The modules can be visited unlimited number of times within the overall course period. Is there any course methodology followed or Can I take the modules as I desire? Yes, there is a methodology followed where the next module will only be available after the user has completed the earlier module. Each module will have explanations and/or tutorial work and at the end of that module there will be a Quiz test. Only after getting passing score in module quiz test, the next session will open up. However, the Free excel tutorials can be taken up anytime and is voluntary. What is the Free Excel Tutorials? And Why do I need to take it? MS Excel is a spreadsheet application that is very popular and used by many people around the globe. Therefore, this can be conveniently used (to a limited extent and subject to the inherent limitations) for data analysis. Important functions of MS Excel are explained in simple and lucid manner with examples and test packs. The users will be able to download the test-packs and practice (subject to version availability as discussed in those relevant course) along with tutorials to get a hands-on experience. This will familiarise you with various functions which you may have used or always wanted to learn. The application of these functions will be explained in the domain ‘methods of investigation’ using test-data and case studies. A pre-understanding of the applications will ease user’s experience in applying the techniques and hence these tutorials are recommended. A practice of MS Excel tutorials will also help users in their daily routines of working with statements, MIS, accounts, etc. and will significantly enhance their skillsets to be more productive at work. Are all software required to avail of this eLearning course provided to me? No, we only provide the tutorials which will be compatible with most of the popular web browsers explained in technical section. Licenses for all software required including (but not limited to) web-browsers, MS Excel, MS Word, MS Outlook, etc. are to be procured by users and we will not be able to provide any support for installations, maintenance or running of these applications. These have to be arranged and managed by users from the suppliers of those software. Similarly all the hardware and devices required shall be the responsibility of the users. Our responsibility is only to make the e-Learning course work on a standard machine with standard installation which can be demonstrated in our office. Is there any support available if I do not understand any specific issue? All course modules are designed by subject matter experts and much of the course is based on experience sharing. The faculties have practical experience of almost a decade in imparting, coaching and educating wide cross-section of people in the subject. Therefore, the course is designed with a view that it will be self-explanatory and in opinion of the faculties no additional explanations are required for any average user. However, except the aforesaid no other guarantee can be given for understanding requirement of each and every one. The course fees and complexity of online education does not allow the faculties to have a one-on-one conversation. However, there is mechanism for a user to give a feedback and rate the modules and depending upon the response the modules will be updated and upgraded to meet the general perceptions. However, this will be at discretion of the subject matter experts. What books will I need to purchase whilst undertaking this Course? There is no need to purchase any books for this course or examination. The contents will be self-sufficient and the user can make relevant notes if required. The course is designed with more practical cases and less of theory. However, recommended books for reference are available on our website and you may order the same if you need to go through more case studies. In what language is the course conducted? The course is conducted in English language only. How can I enrol for the online course? How will I know whether I am eligible to enrol for the course? All graduates (from any discipline) and professionals are eligible to enrol for the course. If you have any doubts please write to support@chetandalal.com giving all the background and we will be happy to respond to you. What are documentation or requirements for enrolling for the Course? The user will have to provide some personal details like name, address, mobile number, email address, etc. The documentation include photograph. and any one identification proof showing photo_id, name and birth date (anyone of Driving License, Passport, Aadhar, PAN, employment id, etc.) to complete the user profile. These will have to be uploaded electronically. With minimum documentation, the user can enrol and start availing of the course contents but without profile completion you will not be allowed to take the final examination and thus will be ineligible for certificate. You will thus have to complete all this well in time of the course expiry period. What if I make the payment for the online course but still am unable to access the course? In case, the payment for the course are successful, you should automatically get enrolled in the online course. In case this does not happen, please write to support@chetandalal.com giving the transaction id received from the payment gateway. We will definitely take care of the same. Will I be getting some enrolment key to access the online course? No, there is no need for an enrolment key for accessing the Online Course. Once the payment has been done successfully, you are automatically enrolled into the course using the username and password that was generated to access our website. How do I make the payment of fees? All fees are to be paid electronically by online transfers or through credit / debit cards or other such mechanisms available during the enrolment process at our website at https://chetandalal.com. After payment of Fees, within how much time the Course will be available to me? The course is available instantly after enrolling and successful payment of fees. What are the rules for refund of fees? Fees once paid cannot be refunded under any circumstances. Hence the users are requested to understand the course and satisfy himself/herself before enrolling. 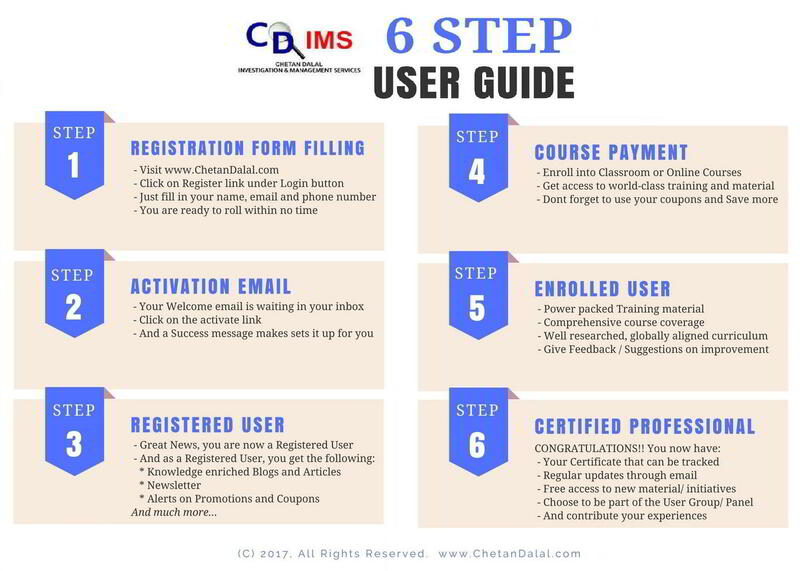 The fees include access to course for the specified period, downloadable files can be used for tutorials and practice, taxes and governmental levies by Government of India, university certification fees and certificate charges. Any other charges not specified herein shall be extra and payable by the user. How much time it will take for me to complete the course? It will depend upon how much time you will spend on the tutorials and practice sessions. A continuous sitting with a reasonable speed you can complete the course in 7-15 days. With week-ends and intermittent learnings during the week-days, the course can be completed within outer limit of three (3)months. Do I need to take the course at any specific hours of the day or spend a specific time during each session? No, you need not spend a specific time or attend to the sessions at specified pre-determined time. You can login at any time on demand and take the sessions depending upon your convenience. This is however subject to other terms and conditions. What is the examination pattern and evaluation mechanism? There are two types of testing mechanism. • Module Quiz Test (MQT) – At the end of each module, MQT will test whether the User has understood the concepts of each module. This test is 4 questions of MCQ type with four options of which one will be correct answer. This test has to be completed within the allotted time and 50% correct answers opens the next module. • Final Certification Test (FCT) – Can be undertaken after completion of all modules and MQT and subject to completion of profile and documentation. This test will be of 100 questions of MCQ type with four options of which one will be correct answer. This test will have to be completed within the time allotted and 50% correct answers will determine successful completion. Where do I go and appear for the examination. All MQT and FCT shall be administered to you online which can be taken up using your login details. It is important that you have stable internet connection and related requirements since the examinations (particularly the FCT) have to be taken in one go and the time will be of essence. We will not be responsible for any connectivity issues affecting your performance. For the Online course, do I have to attempt all the MQT? Yes, in the online course, every sub-module has a test. You have to clear the test by scoring min 50% in each test. Only after you have achieved that score you will be allowed to view the next sub-module. To go to the next module, all sub-modules of the previous module need to be completed successfully. What if I am unable to score the minimum required in a MQT to clear it? All the tests in the online course are open for re-attempts. You can attempt the test any number of times you want till you acquire the minimum score. What if I am unable to get a passing score in the FCT? In case of failure, you will be allowed to appear for another two rounds of FCT after a gap of 72 hours (3 days) from last test. There will be maximum of 3 attempts allowed in total. What if I am unable to get a passing score even after three attempts? Even after the three failed attempts, one more attempt shall be allowed after a lapse of minimum of ten days (from the last third attempt) provided the entire course is re-undertaken during the ten day window. In case of failure in this last attempt, you will have to re-enrol by paying the fees and restart all over again. What is the last date for taking the examinations? The entire course including (without limitation) all tutorials, self-practice sessions, tests and examination, profile updation, eligibility conditions, etc. have to be completed within the Three months. What are the minimum System Requirements to be able to access the online course properly? The minimum requirements Windows 7/Linux/Mc with 1GB RAM and dualcore processor. What are the brower settings required to be able to access the online course properly? The online course and the website can be accessed properly on all latest browsers. Why am I getting the Scorm error while viewing the course material? This error usually occurs when the network is not stable. We recommend shifting to a more stable network for viewing the video, or trying again after sometime. What is the Excel-for-Excel Course? And Why do I need to take it? MS Excel is a spreadsheet application that is very popular and used by many people around the globe. Therefore, this can be conveniently used (to a limited extent and subject to the inherent limitations) for data analysis, audits, making MIS and other general applications. However, it is seen that frequently Excel is used just as statements and a mammoth effort is wasted in many repetitive tasks. Therefore, this course will help you to automate certain processes and use your resources efficiently. All this can be done in simple manner by identifying the processes properly and application of easy Excel formulae/procedures. Is this course an exhaustive teaching for MS Excel? No, this is not an exhaustive learning for the MS Excel. Only a few important (according to our subject matter expert) functions are demonstrated to limited extent that will aid you in your daily applications and general office use. The philosophy and scope is explained separately. What is the philosophy and scope of the e-Learning Excel Course? Important functions of MS Excel are explained in simple and lucid manner with some basic examples and test packs. You will be able to download the test-packs and practice (subject to version availability as discussed in those relevant course) along with tutorials to get a hands-on experience. This will familiarise you with various functions which you may have sporadically used or always wanted to learn. The application of these functions will be explained in relevant examples using test-data. A practice of these MS Excel tutorials will help you in your daily routines of working with statements, MIS, accounts, etc. and will significantly enhance your skillsets to be more productive at work. It is expected that after you have gone through this course, you may be motivated and empowered to explore more and self-design various applications for your working area. Do I need to have prior knowledge of MS Excel? You need to have some experience of handling MS Excel and computers in general. It is expected that you have some basic knowledge of how to move about in spreadsheets, how to create/retrieve/save files, how to copy/paste, pull handles, how to access the drop down menus or access the ribbon menus, how to use function keys, various other configuration settings, mouse handling, etc. No, the e-learning course is not live streaming of any classroom course but a recorded event of various modules. The recording is done in a specific manner where the subject matter expert and learning experts have created work that will optimise best learning for various classes of users. Each module deals with a particular subject wherein there are explanations of the subject with relevant examples. Hands-on tutorials with test packs are also part of the relevant modules that will assist you to practice it along with the course is in background. Yes, you can go in order of serial-wise-module. In case, you are familiar with any modules, you can skip them and proceed to the next. In some modules there are self-practice challenges, you should spend reasonable time independently before looking at our solutions; this will facilitate greater and better learning. You will not miss any module since all are pre-recorded events and the course can be taken on demand anytime, anywhere and on multiple times (subject to terms and conditions). Therefore, you will not miss the module and the same can be taken and revised as you’re your learning requirements. The modules can be visited unlimited number of times within the overall course period. What version of MS Excel should I use? It will be better if you use 2013 and later versions. For older versions, most of the functions will work but the accessing of the menus / ribbons/ functions could be different than those that you see in the course . Some functions which have been introduced only in later versions may not work with older versions. Similarly, there are various other settings in MS Excel which are country specific or language specific; we have used the standard specifications. In case, you have used some other specifications, you need to follow your configurations. For example in some configurations settings the formula use period (“.”) instead of comma (“,”) for separating parameters within a formula in which case you need to use your settings rather than those which are shown in the tutorials. Similarly, there could be other mismatches all of which cannot be elaborated by us; you will have to explore workarounds in case of such disparities. It will depend upon how much time you will spend on the tutorials and practice sessions. A continuous sitting with a reasonable speed or intermittent sitting, you can complete the course in 2-10 days. This course is available for 30 days.